I have a sole proprietor who has disposed of their business during the tax year. Where can I indicate that the Schedule C will not be needed in future years? If the taxpayer has closed or disposed of their business during the tax year, you can indicate this on the Income tab > C- Self-Employment Income screen of data entry. On this screen, there is a check box on the right side of the data entry screen that reads, Taxpayer disposed of business during 201X. 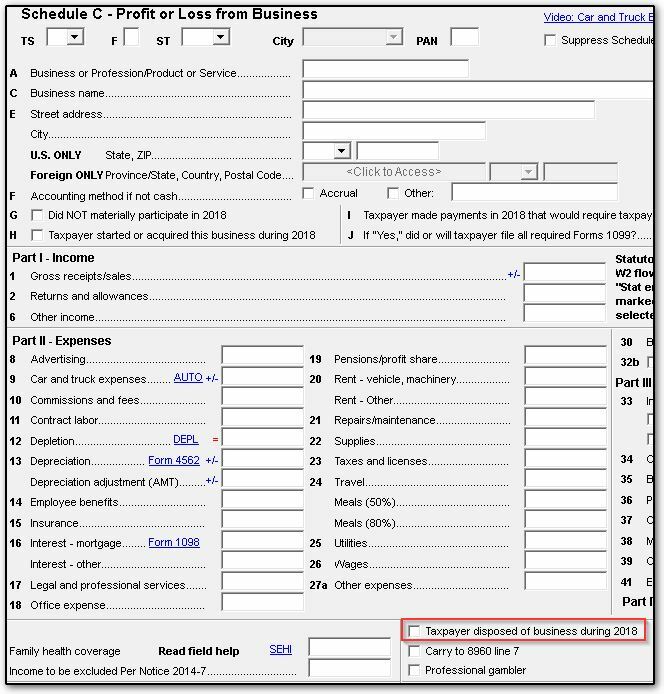 Checking this box does not have an impact on the current year Schedule C calculation, but it will prevent the Schedule C from updating to the next tax year when the client's return is updated within Drake.